The snow is falling on a slant in big, crowded flakes over Windy Bay. We had fog this morning, and then rain, and finally snow, all pointing to a cozy day inside. Christmas cards and wrapping gifts can wait. I want to think about Christmas. We used to do so much running around. The first year America shopped online, I worked for Coldwater Creek on the web team. Terrified of the Internet, people would call and ask if they were online. We would politely have to reply that they were still on the telephone. At first, everyone forgot their passwords, but we could look them up. “That is my dog’s name,” they would say. As the days progressed, the anxiety and stress would increase, and yes, sometimes the call center agents, myself included, would be on the receiving end of a lot of harsh words and yelling. We had to ask if the customer would care to share their email address. With each increasing year, online shopping became more of the norm. During those years, we scrambled to keep up with the volume of business, and we did everything in our power to keep the customers happy. 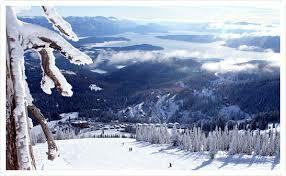 We were proud to work for a company founded by good people and housed in the beautiful town of Sandpoint, Idaho. Sometimes, between calls, my fellow agents and I would commiserate. We bonded. We talked a lot about the meaning of Christmas. It sure didn’t seem like we were hearing it. If packages had yet to arrive, if something did not live up to their expectations, or God forbid, the wrong item got into the box, we had to hear about it. We would wonder what happened to the idea of an old- fashioned Christmas with good food and even better good cheer? We look back; we look around, and we look forward. We think about the story. It is one of the greatest ever told. As a child, it used to make me wonder why Joseph did not start our earlier, why did Mary have to be dragged along if she was having a baby, why didn’t some nice person give up their room at the Inn so that she could have a bed? Why weren’t they better prepared? Times were different, my Mom said. She was glad she had all of us in a hospital. On Christmas Eve, in the city of Toronto, we gathered around the radio, listening for the first reports. They came from the military. As the sky turned dark, regular programming would be interrupted with a news bulletin. A sighting! Clearly visible from NORAD bases in the far north, a sleigh, flying through the pitch black sky pulled by reindeer, he was on his way! 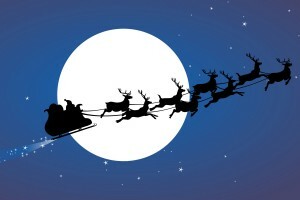 Santa’s journey had begun. We had the cookies and the milk ready. Why were there two Christmas stories, I wondered? On Christmas Day, we looked forward to another tradition. My mother insisted we eat breakfast in the dining room with good china and silver, bacon, eggs, toast and fresh orange juice. It seemed to go on forever, but when we finished eating, we gathered by the radio to hear the Queen. She reminded us, year after year, every year of my life to date, that we should focus on serving others. Wherever we happened to be in the Commonwealth, she wanted to wish us all a happy Christmas with our families and to be mindful of those in need. She was right, is right, and will always be right. There is meaning. There is hope. There is kindness in this world, and there is love. Stress? Who needs it? What we could use is more of the story and more peace. This entry was posted in Christmas, Motivation?Inspiration, Uncategorized and tagged Christmas, NORAD, Queen's Christmas Message on December 20, 2015 by Elizabeth Smythe Brinton.